Steve Rogers wants to fight the Nazis. He has no family and many health problems, and his time appears to be taken up faking his papers and trying to get accepted by the armed forces. But his persistence is about to pay off when he is offered a chance to participate in a scientific experiment. Every army starts with one man. The storyline is a bit fractured. Steve becomes a hero, but fall prey of the World War II propaganda machine and finds himself little more than a front man for chorus girls. When friends are lost behind enemy lines he acts. 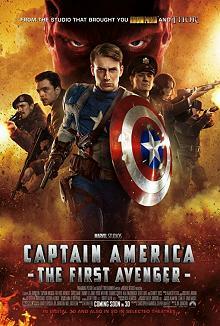 However the producers needed to bring Captain America into contemporary times so they tack a bit on the end. Captain America: First Avenger starts out stronger than it ends. It has the potential for showing the travails of a man of real spirit and dedication, but the character gets lost in passing him through the ticked-off story points. Doesn't live up to its opening sequences.